End of the Century are an "Orange County metalcore quintet." How redundant, huh? 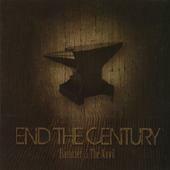 Add End the Century's name into the bingo cage of bands whose feral screaming sounds like a rabid animal's revenge, as the six-track "Hammer and the Anvil" presents a band full of fire but who also seriously lack the compelling compositions to properly get their power across. Tinny guitars, stock arrangements, and overwrought devices are milked to excess here, making this disc a frustrating listen from start to finish. For more information, check out http://www.myspace.com/endthecentury. Copyright © 2008 by R. Scott Bolton. All rights reserved. Revised: 15 Apr 2019 22:35:12 -0400.